Your dog’s constant licking and scratching may be much more than just an annoying habit. These kinds of behaviors are linked to a variety of dog skin problems. Just like people, dogs can suffer from a number of skin maladies—but unlike people, they can’t tell you about it verbally. If you’re looking for dog itchy skin relief, make sure you know the exact problem that’s causing the itch so you can be sure your dog dermatitis treatment will work. Understand the causes of allergic dermatitis and skin conditions in dogs and how to soothe dogs’ itchy skin so you can help your best friend feel great again. Allergies: Dogs have allergies too, and sometimes they’re severe. Your dog may either be intolerant or completely allergic to his dog food or grooming products, or even to environmental factors like mold, insect bites, pollen or dust. It’s important to know what kind of dog food your pet can eat before switching formulas. Atopic dermatitis is an inflammatory, chronic skin disease associated with allergies. In fact, this is the second most common allergic skin disease in dogs. Learn more about the various types of dog skin allergies to see if this is the cause of your dog’s discomfort. Hormonal imbalances: Too little or too much of certain canine hormones can cause itchy skin. Parasites: This may seem obvious, but it’s easy to forget that mites, lice, ticks and fleas all have the potential to irritate your dog’s skin. Mange, also known as scabies, is caused by mites. Flea bites are one of the more common causes of a skin rash caused by a parasite. Seborrhea: More commonly known as dandruff, seborrhea also occurs in dogs and causes greasy, scaly skin. This is usually a sign of some other unresolved issue like a hormonal imbalance when it occurs in dogs. Bacterial infections: Bacterial infections are often at the root of your pet’s skin infections. Folliculitis is a kind of bacterial infection that causes bumps, scaly patches and other itchy problems on the skin; impetigo is another bacterial skin infection that is common in dogs. Fungal infections: Fungal infections are another source of itchy skin in dogs. Yeast is a fungus that commonly infects the ears and paws of dogs; ringworm is another fungal infection that afflicts dogs with very itchy skin. Cysts in dogs: lumps under the skin that are benign. These can be caused by blocked oil ducts, infections, allergic reactions, or injury. Some breeds that are prone to dermatitis are: Boxers, Bulldogs, retrievers (Chesapeake Bay, Curly-Coated, Flat-Coated, Golden, Labrador), Shar-peis, Beagles, Dalmatians and Irish Setters. My dog has itchy skin, but is it really a skin condition? IMPORTANT: Remember, there are more than 160 different skin disorders in dogs, and many of them cause itching! See your pet’s veterinarian for a diagnosis. Fortunately, there are natural treatments you can pursue for dog itchy skin relief, and it starts with nutrition and the right dog food formula. A dog’s diet is often overlooked, but almost every breed of dog has food sensitivities, either due to genetics or the fact that many dogs are fed the same food for months or even years, with no variety in ingredients or alternative sources of nutrition. Skin lesions or itching along with red and inflamed ears and possibly diarrhea, are classic signs of food allergies. A dull, coarse ‘staring’ coat and / or oily, smelly skin are hallmarks of a poor quality diet being fed. Excellent nutrition should be the first weapon in your arsenal. Making sure your dog has a healthy dose of the following nutrients in its diet is a good place to start. Antioxidants: Antioxidants like Vitamin E are essential to maintaining a healthy canine immune system and to protect your dog’s system from free radicals and cellular oxidation. Essential fatty acids: For well-nourished skin, your dog’s food should contain high levels of omega-3 and omega-6 fatty acids. These can be found naturally in fish oil, and they help control inflammation, prevent dryness and otherwise protect your dog’s skin. Protein: High-quality protein provides the building blocks to repair damaged skin. Feeding unique protein sources, such as venison or duck, can also help reduce reaction in dogs with a food allergy or intolerances to more common ingredients. Coconut oil: Coconut oil is great for your dog’s coat and general health. Simply mix some into your dog’s meal. There are dog-specific brands, but human brands are fine. There are also treats that include coconut. Yogurt: Plain, low-fat yogurt is not only a healthy treat, but a boost to your dog’s immune system. It keeps the good bacteria in your dog’s intestines in balance and helps keep yeast infections at bay. Dandelion greens, celery, spinach and lettuce are all foods that can help cool a dog’s body, which can help with irritated skin. If you feed your pet a food that contains a good combination of these critical nutrients you can manage your dog’s skin condition more easily. Whether you’re a dog or a human, great nutrition is essential to your health and well-being. Balanced nutrition allows your pet to enjoy a healthy, active lifestyle. Excellent nutrition is even more important when your dog has a skin problem. For accurate diagnosis and treatment options, always consult your veterinarian and ask them to recommend the best products for your dog’s skin problem. There are several other all-natural remedies you can try on your dog’s itchy skin. First, here are a couple things you should already be doing. Brush your dog every day and give him a bath once a month! Simply brushing your dog’s coat can help to control and eliminate itchy and irritated skin. Bathing your dog with a non-irritating shampoo or other natural remedy (see below) can also provide your dog some relief, just don’t bathe him too often. Once a month is fine. Keep in mind that while a good shampoo can bring relief, your dog might not need to be “squeaky clean.” Many dog shampoos do their job too well, pulling away waxy oils from your dog’s skin and drying it out. Vitamin E is also effective as a topical treatment. It works on a dog’s dry skin just like it does on your wrinkles. Break open a capsule and rub the oil directly into your dog’s dry, itchy areas. Chamomile & Herbal Tea soaks kill bacteria and yeast on the skin and can relieve inflammation. This treatment works best when the tea is chilled in the refrigerator. It can also be sprayed on sensitive, itchy spots, like your dog’s paws. Warm tea bags can soothe itchy eyes for both you and your dogs. There are also many calendula-based gels, sprays and lotions available in stores. Other options include green tea and calendula. Try a ground oatmeal bath. Oatmeal is an old remedy for itching, inflamed skin. A warm bath with ground oatmeal will give your dog immediate relief. Use baby oatmeal or grind it up in a blender. Rub the oatmeal liberally into your dog’s coat and let it remain as long as your pup will allow before rinsing and brushing it out. Epsom salt soaks and heat packs can reduce the swelling of itchy paws and inflamed sores. Warm Epsom salt baths speed up healing time for small, open sores. Evening primrose oil, an essential oil, has active anti-inflammatory and anti-itch properties. Primrose oil can be applied directly to your dog’s skin to treat dry or itchy skin issues, or orally to help calm allergies and boost the immune system. Simply add a few drops to your dog’s food or water. You can also try an essential oil shampoo. Just add a few drops of eucalyptus or pennyroyal essential oil to a natural shampoo or castile soap. After washing, rinse your dog with clear water, then rinse again with a vinegar-water mix (1 tbsp. to 1 pint warm water). This shampoo is easy to make and the rinse removes soap residue that can result in dandruff, which causes itchy skin. Make a eucalyptus conditioner. Eucalyptus repels fleas and promotes a soft, glossy coat. Make this conditioner by steeping 1 teaspoon of dried eucalyptus (or 2 tablespoons of fresh eucalyptus) in a pint of boiling water for 10 minutes, covered. Remove the eucalyptus water from heat and allow it to cool to body temperature, then pour it over your dog after a bath. Rub the mixture in and towel your dog dry without rinsing. Make a natural dry shampoo. This is great for dogs that hate getting into the bath. This requires a bit of work, but will give your dog healthy skin and a good-smelling coat. Start by spreading ½-cup to 1-cup of whole bran, uncooked oatmeal, or cornmeal on a cookie sheet and warm it in the oven on low for 5 minutes. This will bring out the natural oils in the grain. Take a handful and rub it into your dog’s fur and skin with a towel, concentrating on the greasy, dirty areas, then thoroughly brush your dog to remove all the grain. This will exfoliate your dog’s skin and remove any nasty residue from your dog’s coat. An Herbal Flea Powder is made by combining dried and powdered herbs like rosemary, fennel, eucalyptus, rue, yellow dock, and wormwood. Brush your dog, then sprinkle small amounts around the neck, belly and back. Do this several times a week, and make sure it’s done outside, so the fleas don’t just end up in your home. A natural, lemon-based skin tonic will also repel fleas and work as a skin toner for itchy dogs. Steep a sliced lemon in a pot of boiling water overnight, then work the solution into your dog’s skin. Let the skin air dry. 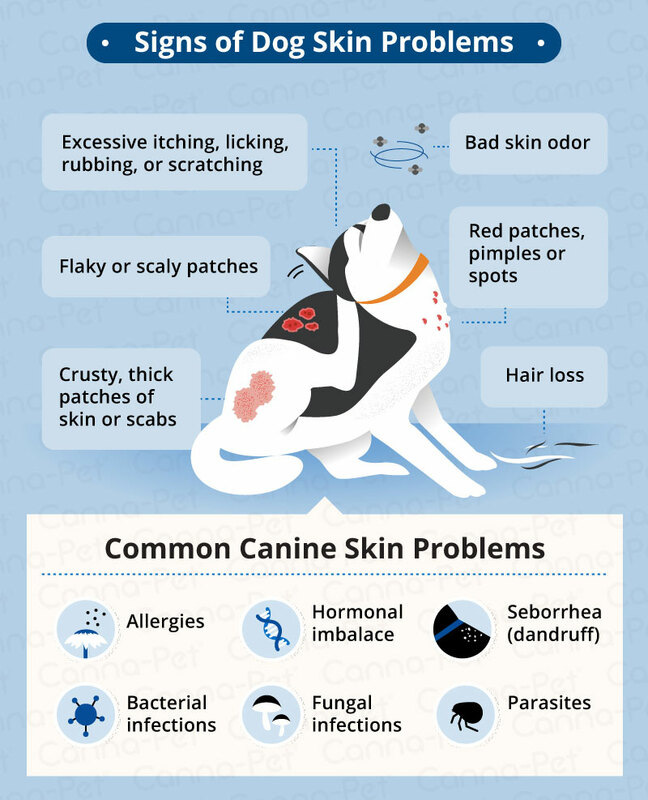 You can also try using natural supplements like Canna-Pet to help relieve the discomfort of some of these skin conditions in dogs. Hot spots are painful, red eruptions that can occur anywhere on your dog’s body. These are concentrated lesions that can become worse when your dog scratches or licks it to try to relieve the itching. Aloe vera is a soothing herb that can be used topically. You can grow an aloe plant at home and cut off a piece when your dog has a hot spot. Just rub the gel from the plant right onto the affected area. Make a thick, baking soda/water paste and apply it to hot spots on your dog’s skin. Leave the mixture on for 20 minutes, then rinse it off. If your dog is itching all over, you can add a cup of baking soda to your dog’s bath. You can also try a 50/50 mix of apple cider vinegar and water, and use a spray bottle to apply it to your dog’s hot spots. For cases where open open scratches, scabs, or sores are visible, a combination of calendula and comfrey with sage, bee balm, thyme, and/or yarrow tea in equal proportions will help accelerate the healing process and inhibit bacterial infection. In more severe cases where the skin is flaky, red, and your dog is continuously scratching or chewing, stronger solutions may be needed. In a pot of water, bring the herbs to a gentle boil and simmer for 10 minutes. Remove from heat and let the mixture cool. Strain the fluid and coat the dog’s skin and coat and drip dry. These natural remedies are available at stores near you. Give them a try for a happy, itch-free pup! And don’t forget about products from Canna-Pet® as well. Meet Dexter! Dexter, a five-year-old mini Australian Shepherd, suffers from severe allergies. His owner, Zellie, reports that whether it be fleas, the season, or dry skin, it seems like Dexter is always itching or scratching at something. However, since being introduced to Canna-Pet, Zellie rarely finds Dexter scratching and he seems happier than ever. To read more customer success stories, explore Canna-Pet’s Testimonials page here!